The Sinquefield Cup is an annual, invite-only chess tournament in St. Louis, Missouri, United States, honoring Rex Sinquefield and his wife Jeanne, the founders of the Chess Club and Scholastic Center of Saint Louis. The first edition (working title: 2013 Saint Louis International) was held from 9 to 15 September 2013 at the Chess Club and Scholastic Center of Saint Louis in St. Louis, Missouri, United States. The four grandmasters played the classic time control 40 moves in 90 minutes with a 30-second increment as of move one, followed by 30 minutes for the rest of the game in double round-robin format. The total prize fund was $170,000, with $70,000 going to the winner, $50,000 to runner-up, $30,000 to third place and $20,000 to fourth place. The average FIDE rating for the field was 2797, the highest rated tournament at the time. The opening ceremony took place on 8 September 2013, and round 1 was held the next day. This was the last tournament for Magnus Carlsen before the World Chess Championship 2013. The second edition was held from August 27 to September 7, at the Chess Club and Scholastic Center of Saint Louis. It is by rating the strongest tournament in the history of chess, as measured by actual average Elo rating of 2802 for the six participants, all in the top ten of FIDE's Elo rating list. The six grandmasters again played the time control of 40 moves in 90 minutes with a 30-second increment for every move, followed by an additional 30 minutes plus the per-move-increment for the rest of the game, in a double round-robin tournament. According to the FIDE rating, the players were Numbers 1, 2, 3, 5, 8 and 9 in the world. The total prize fund was increased to $315,000, with $100,000 going to the winner. After round 7, Caruana had achieved a score of 7/7, which was described as a "historical achievement" by Levon Aronian. Caruana drew his remaining games to finish with 8½/10 and a performance rating of 3103, the highest ever performance rating in a single tournament, besting Carlsen's performance in the 2009 Nanjing Pearl Spring tournament and Anatoly Karpov in the 1994 Linares chess tournament. It was compared to Bobby Fischer's 20-game winning streak in 1970–1971. Vachier-Lagrave finished fourth, ahead of Aronian on tie-break (direct encounter). The third edition was held from August 22 to September 3, at the Chess Club and Scholastic Center of Saint Louis as the second leg in the 2015 Grand Chess Tour. The tournament featured the seven top players in the world, a feat only surpassed by the AVRO 1938 chess tournament. The Sinquefield Cup is also the strongest tournament featured in the 2015 Grand Chess Tour with an average FIDE Rating of 2795. The 2015 Sinquefield Cup was a single round-robin event held with a time control of 40 moves in 2 hours, followed by the rest of the game in 1 hour with a 30-second increment from move 41. Wesley So was selected as the tournament invite and joined the nine other players already participating in the Grand Chess Tour. The 4th Sinquefield Cup was played between August 4 and 16, 2016. It was rescheduled due to a clash with the 2016 Baku Chess Olympiad. This Sinquefield Cup is one of the tournaments of the 2nd Grand Chess Tour. Ding Liren was selected as the Wild Card for the Sinquefield Cup. Vladimir Kramnik withdrew from Sinquefield Cup for health reasons. Fellow Russian player Peter Svidler replaced him. The prize fund was US$300,000, with $75,000 for 1st place, and points toward the overall 2016 Grand Chess Tour. Players received 120 minutes for 40 moves then 60 minutes for the rest of the game with an additional 30 seconds added per move starting from move 41. In case of a 2-way tie, a 2-game Rapid Match (10 minutes + 5 seconds increment starting from Move #1) followed by a 2-game Blitz Match (5 minutes + 2 seconds increment starting from Move #1) if tied again was to be played. If a tie after the Blitz match, an Armageddon game would decide the winner. All ratings listed below are from the August 2016 rating list. On August 14, 2016, Wesley So won the tournament, with 5½ points out of 9 (+2−0=7), ahead of former World Champions Veselin Topalov and Viswanathan Anand, and former winners Levon Aronian and Fabiano Caruana. The 5th Sinquefield Cup was played from August 2 to August 11, 2017, and was the third leg of the 2017 Grand Chess Tour. It was won by Maxime Vachier-Lagrave, with 6 points out of 9 (+3−0=6). 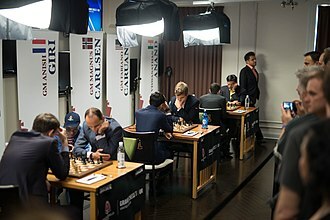 The 6th Sinquefield Cup was the fourth leg on the Grand Chess Tour 2018; Carlsen, Caruana and Aronian tied for first, all with 5½ points out of 9 (+2−0=7). The deciding tiebreaker involved the drawing of lots to decide which two players would participate in the playoff for the title. Carlsen objected to this random chance tiebreaker and proposed a three-way playoff. Caruana did not agree to the three-way playoff as he had a playoff with So for a place at the 2018 London Chess Classic scheduled on the same day (Fabiano Caruana qualified to London after beating Wesley So in a playoff 1.5–0.5). The trio reached a compromise and agreed to share the title. ^ "St. Louis To Host Four Leaders - chess-news.ru". www.chess-news.ru. Retrieved 12 August 2017. ^ "Carlsen and Aronian to play in US Super-GM". 17 June 2013. Retrieved 12 August 2017. ^ "U.S. Chess Champs: The Sinquefield Cup". Archived from the original on 10 September 2013. Retrieved 12 August 2017. ^ "Carlsen, Aronian, Nakamura, Kamsky to play in first "Sinquefield Cup" - ChessVibes". www.chessvibes.com. Retrieved 12 August 2017. ^ "Sinquefield Chess Cup 2013 LIVE! - Chessdom". www.chessdom.com. Retrieved 12 August 2017. ^ "Live - www.uschesschamps.com". uschesschamps.com. Retrieved 12 August 2017. ^ Sinquefield Cup, chessbase.com, 2014. ^ Roeder, Oliver (5 September 2014). "Fabiano Caruana Is Doing The Impossible At Chess's Most Competitive Tournament". Five Thirty Eight. Retrieved 5 September 2014. ^ a b Stevenson, Seth (18 September 2014). "Grandmaster Clash". Slate. ^ Campbell, Bradley (4 September 2014). "The Italian Bobby Fischer is making chess history in St. Louis". PRI. ^ "Rules & Regulations: 2014 Sinquefield Cup - www.uschesschamps.com". www.uschesschamps.com. Retrieved 12 August 2017. ^ "2014 Sinquefield Cup Pairings & Results - www.uschesschamps.com". www.uschesschamps.com. Retrieved 12 August 2017. ^ (PeterDoggers), Peter Doggers. "Top Players Return To St. Louis; 3rd Sinquefield Cup To Start Sunday - Chess.com". Retrieved 12 August 2017. ^ a b "Overview - Grand Chess Tour". grandchesstour.com. Retrieved 12 August 2017. ^ "2015 Rules & Regulations - Grand Chess Tour". grandchesstour.com. Retrieved 12 August 2017. ^ "Grand Chess Tour Announces 2016 Participants". chess.com. Retrieved 9 April 2016. ^ "Vladimir Kramnik withdraws from Sinquefield Cup". Retrieved 1 August 2016. ^ "Standard Top 100 Players August 2016". Retrieved 1 August 2016. ^ "Grand Chess Tour 2016 – ChessHive". chesshive.com. Retrieved 12 August 2017. ^ "Sinquefield Cup 2016 - The Week in Chess". theweekinchess.com. Retrieved 12 August 2017.